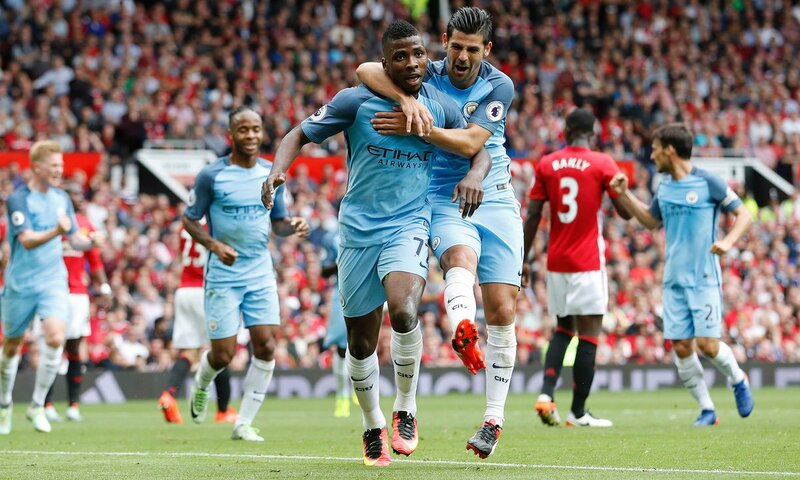 Super Eagles sensation Kelechi Iheanacho scored again for Manchester City in their 4-0 win against AFC Bournemouth in their Premier League clash at the Etihad Stadium on Saturday. Kevin de Bruyne opened scoring in the 15th minute, Iheanacho doubled the lead in the 25th minute, while the duo of Raheem Sterling and Kevin de Bruyne completed the rout in the 48th and 66th minutes respectively. The team ended the game with 10-men as Nolito was sent off in the 86th minute. The win ensures Manchester City maintained their 100% start to the season with five wins from five games played amassing 15 points, while the 19-year-old Nigerian has now scored in three successive games for Pep Guardiola’s side, thereby scoring two goals in the new EPL season. Elsewhere at the KCOM Stadium, Iwobi lasted 77 minutes for Arsenal in their 3-1 victory against newly promoted Hull City FC on Saturday. Chilean forward, Alexi Sanchez missed a penalty, but later scored brace in the 17th and 83rd minutes. Theo Walcott and Granit Xhaka also scored for the Gunners in the 55th and 90th minutes, while Robert Snodgrass reduced the tally for the home team to end the game 4-1 at full time. Hull City also ended the match with 10-men, as Jake Livermore was sent off in the 40th minute. In the other encounter, Super Eagles vice-captain, Ahmed Musa was an unused substitute for champions Leicester City in their 3-0 victory against Burley at the King Power Stadium. I slam Slimani scored a brace, while Burnley defender, Benjamin Thomas “Ben” Mee scored an an own goal to make it 3-0 for Leicester.